Once again the Megawatt has returned and this time he is targeting the Town of Bellwood. Ben will never be going to let him destroy the town and he is all set to fight against him in Ben 10 Saving Bellwood Game. Ben doesn’t leave with any choice but to transform himself into Heatblast to stop the attack of Megawatt. Help Ben in Saving the Town of Bellwood but before that read further about the gameplay! The Town of Bellwood is under the attack from the energy balls of Megawatt. Megawatt has already got more powerful than ever before as he soaked all the electricity from the town. The Megawatt has now arrived to destroy the hometown of Benjamin Tennyson and he is continuously hitting the electricity balls to fire up the entire town. Ben already knew what to do and he transformed into HeatBlast to fight against the Megawatt. Recommended: Play Ben 10 Omniverse Games online for free now! 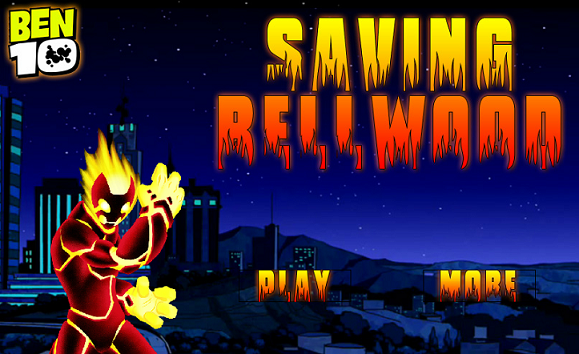 In Ben 10 Saving Bellwood Game, you will be playing as Heatblast and Help Ben to defeat the Evil Megawatt from occupying the town of Bellwood. Megawatt will throw Electricity balls at the town and you have to target them all with the fireballs of the Heatblast. With every target you hit, the electricity ball gets divided further into multiple small balls and you have to finish them all before reaching the Town. Pro Tip: Destroy the Electricity Balls Before it Reaches to the Town. Hit Multiple Fireballs at the same time to Destroy the Electricity Balls fast. The Life of Bellwood Town is in your Hand. Save the people from getting Burned by the Electricity Balls of Megawatt! Don’t Forget to give your rating for Ben 10 Saving Bellwood game and share your tips and tricks to win this game in the comments section below.